Dowsers seem to be rather thin on the ground in Eastern England, which is a pity because it is an area in which there is a very real potential for dowsers to make practical use of their skills in the field of archaeology. This is particularly the case if you are of a practical bent like me, and may not feel able to contribute to the more academic aspects of dowsing. We are all aware that there is still a good deal of prejudice amongst the professions, not least the archaeological establishment. Against that archaeology has to take its place in the queue in terms of public sector funding, behind health, education, transport, virtually everything else in fact. Dowsing kit doesn’t cost anything. That said, breaking down old prejudices can still be a hard job, the only way to do it is by gradually building up one’s own credibility. That requires practice, practice, practice, keeping at it, and gradually developing one’s skills. 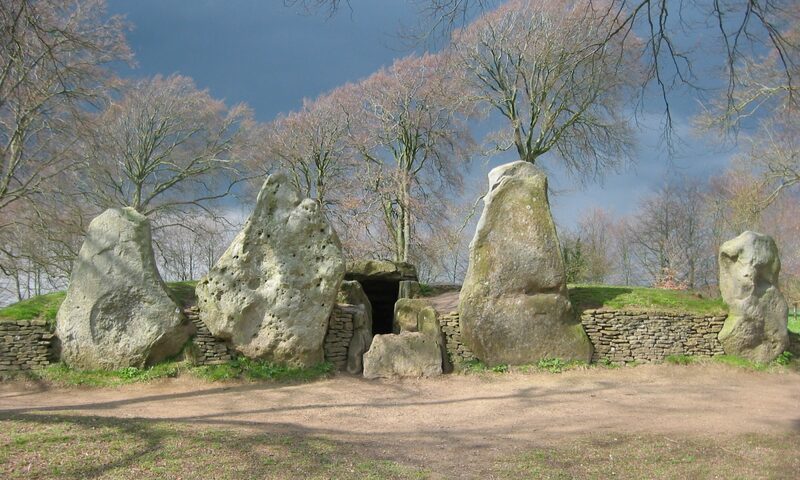 Most of the megalithic and other ancient sites in England seem to be concentrated along and around the spine of the country. Wessex is fortunate in that it has retained significant areas of grassland, while much of Salisbury Plain has been retained for military requirements throughout most of the 20th century, thus protecting it from the destructive impact of deep ploughing, which has obliterated so much of the archeology of the east of the country. Another important reason for the relative scarcity of ancient sites in the region between the Wash and the Thames Estuary is the absence of natural deposits of stone, apart from a few outcrops of septaria along the coast. Abundant evidence of human occupation continues to emerge, however, not only through crop marks but also through the collection of artifacts, coins, pottery shards, flint arrowheads and hand axes some going back to the Paleolithic. The recently discovered Lynford Quarry near Thetford in Norfolk, some 6000 years old, is said to be one of the most important Neanderthal sites in the country. Not many miles away in Brandon Forest is the great flint mine of Grimes Graves. Has anyone dowsed the earth energies around the Holy Well at Walsingham? It is also in this area that many of the major hoards of Roman coins have come to light. The local Iceni tribe and their southern neighbours, the Trinovantes, led the Great Revolt against Rome in AD.60 which we are told rocked the Empire to its foundations and even caused Nero to consider abandoning Britain altogether. There is probably much dowsable evidence still buried in the landscapes of Essex and East Anglia which could throw more light on the history of the period and its aftermath. Along the east coast between the Wash and Southampton Water the Romans built a series of shore forts. A recent book ‘The Roman Shore Forts’ by Andrew Pearson (Tempus. ISBN 0-7524-1949-8) hints that much has still to be learnt as to how they fitted into the local and national context. It is something else which local dowsers could get their teeth into. It was on the shore near Brancaster, the first of the Shore Forts, that the Bronze Age ‘Seahenge’ appeared. Digging it up and taking the bits to Flag Fen caused passionate controversy at the time and some will remember the excellent television programme on the event. In the course of it Francis Pryor made the point that the henge was probably built and used by a local commune or extended family group and that all such groups may well have had their own henge. Although the number known in these parts is tiny, I have dowsed the outlines of three within two miles of where I live, and a few days ago part of the Wigborough Henge site on a farm owned by the Essex Wildlife Trust. It was first spotted as a crop mark by a lady pilot. There must be many more across the region as a whole. They vary in their size and their characteristics, some have rings of post holes, some don’t. We cannot know for certain what henges were used for, but they were places where people met. Where were their settlements, what were their daily activities and with whom did they trade? What are the earth energy patterns in relation to them? The depopulation and decline of the eastern counties during the Roman period laid them open first to the Anglo-Saxons. It later became part of the Danelaw. Essex was the first of the Anglo-Saxon kingdoms to be Christianised by St. Cedd in 653/4 within a generation of the pagan Sutton Hoo ship burials near Woodbridge, not many miles away as the crow flies. In my admittedly limited experience, many landowners and farmers are helpful and happy to take an interest. I have been surprised to find that some actually dowse themselves to find land drains etc. I have dowsed farms where the owner has asked for help in locating headers or pinpointing blockages. On Hill Farm, Gestingthorpe, the site of an important Roman settlement where I have been dowsing to locate lost Roman roads leading into it, three large holes about 6ft deep suddenly appeared in a field 2 years ago after that wettest of winters. A similar incident had occurred in the same field in 1922 when a hole suddenly opened up under a horse which was ploughing. In those days it took a team of men all day to rescue the wretched animal! The field was on set aside and about to be ploughed. Ashley Cooper, the farmer, didn’t want his tractor disappearing so I was asked if I could dowse to find the course of the underground stream which it was assumed must be responsible. Dowsing indicated that some geological anomaly was at the root of it. I know nothing about geology but my rods guided me round a very irregular outline enclosing some 20 acres. They then indicated a small area of maximum risk , about half an acre, with the existing holes at one end. Two weeks later two more holes appeared at the other end but still within it, much to my delight and relief! This is the kind of thing that can come one’s way and helps the credibility of dowsing – as long as you get it right. Within an easy walking radius of where I live there is enough archaeology out there in the landscape to keep a dowser busy for half a lifetime – one much younger than I! On my way home from the Frilford week end in April, Derrick Philpott invited me in for a ‘cuppa’ . I was amazed at what he has found just in his garden on the edge of Northampton. In addition he recently found himself involved with Time Team on one of their digs at Raunds. The purpose of all this is to encourage more fellow members to join the comparatively small number of us who seem to be active out there in the landscapes. Our dowsing skills can make a useful contribution in furthering the knowledge and understanding of the history of our localities and thereby help to boost a growing sympathy towards dowsing amongst the general public.